What is an alloy? An alloy is a metal made by combining two or more metallic elements. Fine silver is almost pure silver and it is relatively soft. That is why it is alloyed with copper to increase its hardness and strength. What is that black color you use in your jewelry? Oxidized sterling silver. The beauty of this finish is that it does not have to be cleaned (it is oxidized on purpose so never ‘tarnishes’ in an unwanted way) and it has a rich, dark color that is modern and mysterious at the same time. Almost all of the silver used in Raïssa Bump Jewelry is recycled material from Hoover & Strong, a company that promotes and maintains environmentally practices. They refine and mill the recycled material into to sheet, wire, tubing etc. as seen in the image to the left. Beads come in all kinds of shapes, sizes and materials. 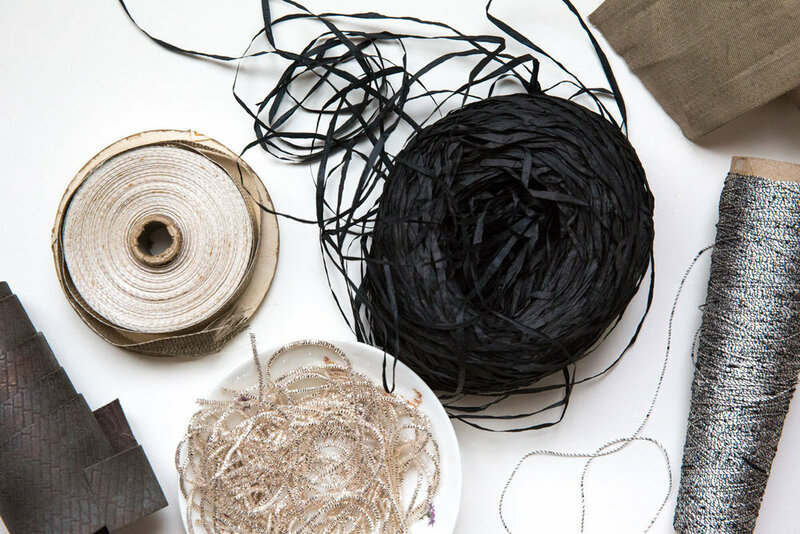 The unifying thing is that there is a hole in them for stringing, stitching, threading etc. They have a rich history and have been used and traded for most of our human history. Raïssa Bump Jewelry employs either vintage beads manufactured in places like France and Czech Republic or quality, modern beads from Japan. They are a way to add color and texture to her jewelry. SHAPES: Seed beads come in various shapes, and sizes. Typically used are the small rounded or faceted ones. Bugle beads are tubes of various lengths and diameters; some are twisted to form a spiral along the length of the bead. MATERIALS: Most of the beads used in Raïssa Bump Jewelry are glass beads. Some are lined with silver, 24k gold or copper foil. Some are plated with silver,24k gold or palladium metals. Occasionally stone beads of various shapes and sizes are used. Textiles - the process of making them and the finished pieces of fabric -- are a love of Raïssa's. She has collected different fabrics/ribbons made with silver or steel, paper or silk yarn, dyed her own silk thread to vibrant colors and has saved used or unused sand paper for its pattern or shimmer. These materials take a special care and techniques employed are labor intensive. You will mostly see them in Raïssa Bump's one-of-a-kind jewelry. Techniques: knitting, knotting, sewing, weaving. The sparkle and texture that can be created from sewing sequins in various patterns is what Raïssa love's. MATERIAL: If you see sequins in Raïssa Bump Jewelry it is plastic and has been sourced from auctions, flea markets or estate sales. 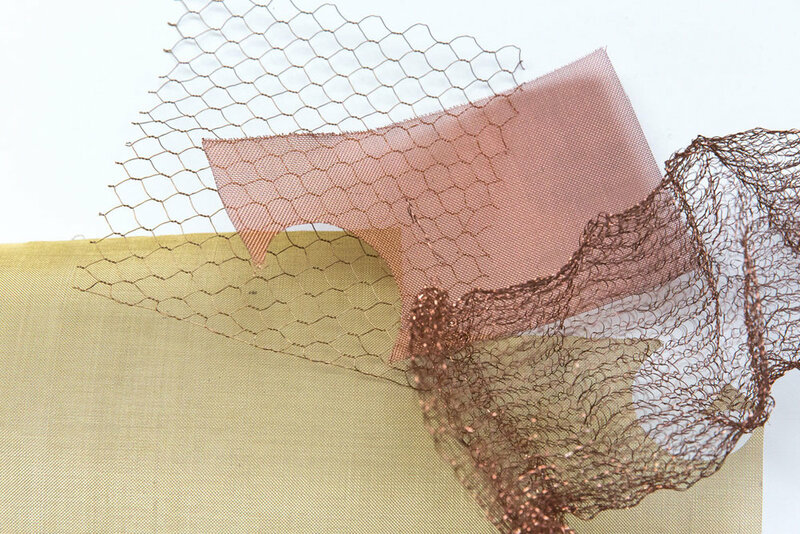 MATERIALS: Copper and brass screens, copper or stainless scrubbies, steel grates, fine silver mesh have all made their way into the layers of Raïssa Bump Jewelry. Defined as a hard, brittle substance, typically transparent or translucent, made by fusing sand with soda, lime, and sometimes other ingredients and cooling rapidly, Raïssa uses clear or mirrored glass. Often vintage finds, where age is evident, the glass employed is used often for mood and mysteriousness, sometimes with the added bonus of protection. Translucent to opaque, silvery to golden, mica shimmers when light hits it. As it is heat resistant, it is used across various industries. Raïssa employs discs, washers, stampings and sheets in her both her one-of-a-kind and collection jewelry. NATURAL MICA: A mineral name given to a group of silicate minerals. It is found in high silica rock deposits formed when lava cooled very slowly. It is often found in veins with feldspar, quartz, and semi-precious stones such as topaz, beryl, garnet and tourmaline. 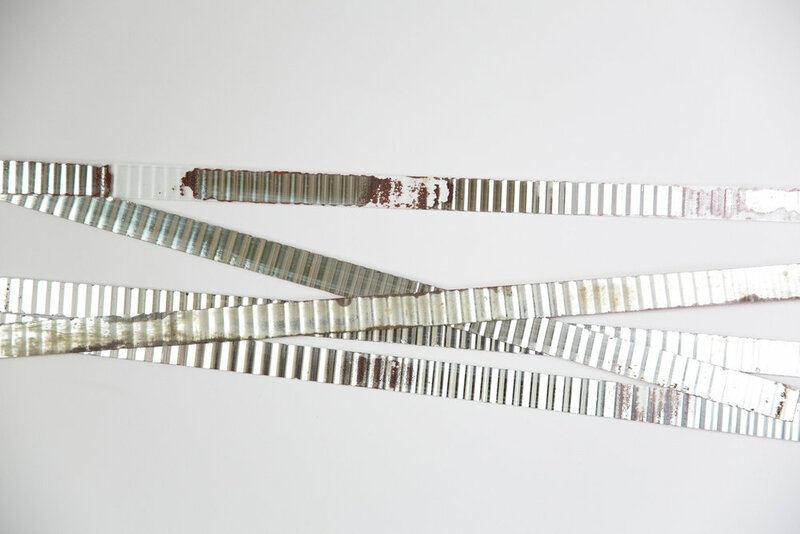 It separates easily into thin, strong, usually transparent layers. Natural muscovite mica is often a ruby color, but also green, smoke or dark amber and streaked and dotted with black markings. COMPOSITE MICA: Composite mica is finely flaked natural mica formed into sheets with a shellac binder. (Shellac is a resin secreted by the female lac bug).